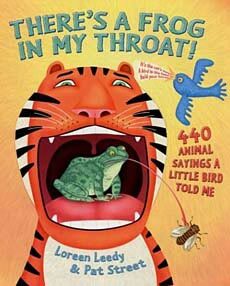 This book by Loreen Leedy is exactly what the title says--440 different idioms about animals. Wow! Each one is illustrated and paired with a short explanation of what it means. There's always a lot going on in Leedy's books, but this one 'takes the cake.' Considering how many idioms are packed into this book, we were glad Leedy also included an index at the end! Pair this title about animal idioms with Arnold's books about human body idioms (here) and you have yourself enough fun idioms to base an entire idioms unit around. School Library Journal said kids will "find themselves captivated by the engaging text and great illustrations." And in a starred review, Booklist said, "This book is just ducky! It's the cat's pajamas! It's more fun than a barrel of monkeys!" Below and at right are sample spreads from inside this book. As you can see, this book isn't exactly suited for story time. 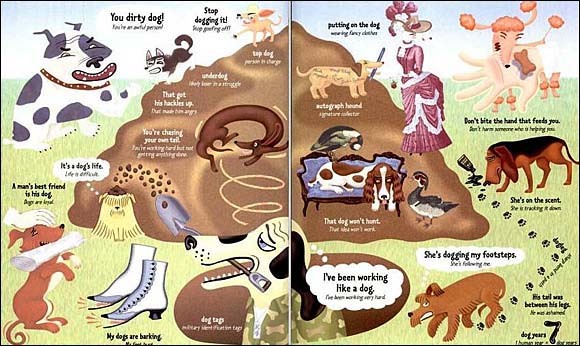 However, if you are looking for idioms about animals, we can confidently say 'look no further.' This is the definitive collection! 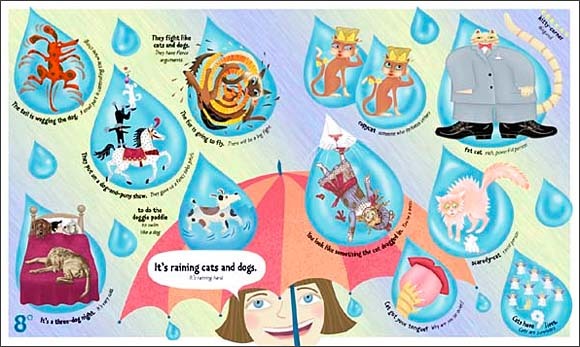 In each spread, idioms are printed in bold font and are shown right next to a humorous related illustration. A short explanation is included just below the idiom. For example, in the left spread, located the dog in the middle shown chasing his tail. Next to the illustration is the following bold-faced sentence: You're chasing your own tail." Underneath that, in regular font, the text reads, "You're working hard but not getting anything done."